I've finished my solar oven that I made from an old conventional oven. you can see video on youtube my channel is "centervilletn" just search solar oven, centerville tn and you should see a couple of videos of it in use. 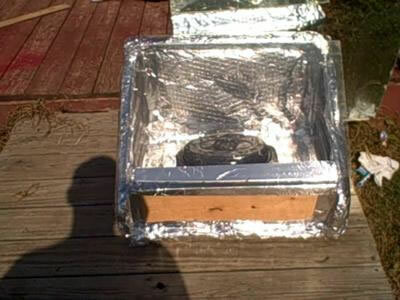 It's always good to see what others are able to do with just a "bunch of junk" and come up with a great solar cooker. I also live in Centerville. Are you related to Paul Burks? I worked with him at Dickson at Goodlark Hospital. I am building solar ovens also.